Moon blindness is an inflammation of the eye affecting the uvea or vascular tissues of the eye. It may affect one or both eyes. It is also known as equine recurrent uveitis (ERU), iridocyclitis and periodic ophthalmia. According to Dr. Brian C. Gilger, DVM, this disease affects approximately 2 percent of all horses, with Appaloosas disproportionally affected. 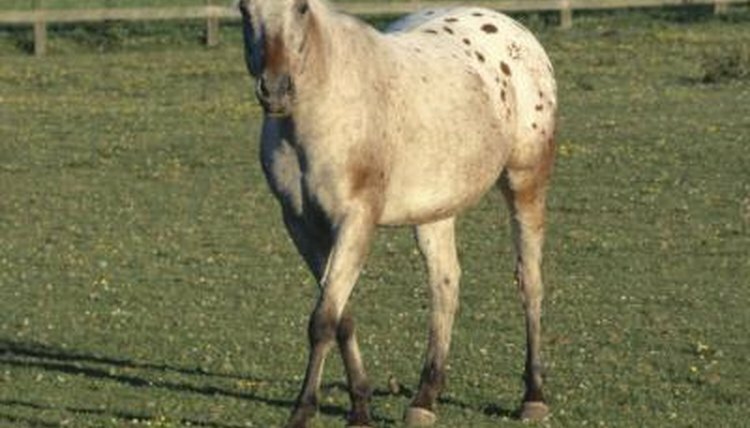 Up to 25 percent of all cases of moon blindness are found in the Appaloosa breed. While some cases of moon blindness resolve on their own, many horses go completely blind from the disease. Moon blindness may be divided into two types, chronic and acute. In chronic moon blindness, the horse's eye shows constant signs of an immune system response. Some degree of inflammation is always present in the eye. Acute cases are sudden onsets of inflammation that go away completely once the underlying cause is treated. Chronic moon blindness may be caused by viruses, bacteria or parasites infecting the eye. Acute moon blindness can be caused by accidents or trauma, such as a horse getting hay, dirt or another foreign object lodged in the eye. Why Appaloosas seem to get moon blindness more than other horse breeds is unknown, but genetic susceptibility may play a role. Symptoms of moon blindness vary. The affected eye may be reddened or cloudy-looking. The horse may shy away from objects on the affected side since his vision is impaired. He may squint, blink or tear from the infected eye. He may also be sensitive to light or sudden changes in amount of light, such as when he's walked out from a darker stable area into bright sunshine. Moon blindness cannot be cured. Treatment goals include pain relief, minimizing inflammation and resolving the underlying infection or trauma. Non steroidal anti-inflammatory pain relief medication and topical steroids may be prescribed by a veterinarian to improve the horse's comfort and reduce swelling. Researchers are currently experimenting with time-released cyclosporine implants.